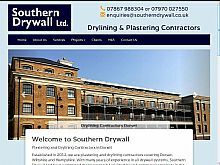 Southern Drywall, located in Poole, offer a range of dry lining and plastering services in Dorset, Wiltshire and Hampshire to commercial and residential property developers. With over 25 years’ experience as drywall contractors, Southern Drywall offer professional building services. Based in the Poole / Bournemouth area, Southern Drywall have worked on a large number of commercial developments providing drywall installation and dry lining services for leading property developers in the South of England. Are you looking for a local commercial plasterer in Dorset to help you refurbish your residential property development? Then look no further, Southern Drywall Limited are one of Dorset’s most experienced plastering companies providing a high-grade ready to paint finish. Specialising in spray rendering and insulated render for commercial and domestic developments, Southern Drywall Limited provide rendering services in Swanage, Poole, Bournemouth, Ringwood and the surrounding areas. Expert floor screeding contractors, this company offer floor screeding services in a variety of finishes at very competitive prices. Southern Drywall Limited also install insulation and suspended ceilings. If you are a property developer in need of plastering or drylining contractors in Poole, Bournemouth, Swanage, Southampton, Ringwood, Dorchester, Winchester, Salisbury or across the South of England. please contact Southern Drywall today!